Leaving grass a little longer will help it to withstand dry weather. Set the blades on your lawn mower a little higher and if you must cut your lawn, simply cut the top off. But consider allowing a wilder, weed filled meadow to grow. This is not only good for the grass, it is good for wildlife too. Laying a heavy organic mulch around trees and shrubs will help to control the moisture level in the soil and reduce water loss due to evaporation. The nutrients in the mulch will also contribute to keeping plants healthy, and healthy plants are better able to withstand a period of very dry weather. Whether in a polytunnel or in outside growing areas, mulching annual crops will also help to keep these edible crops healthy and happy. If you are growing your own food in your garden then you may find it difficult to keep up with the watering demands of intensively grown annual crops. In addition to laying mulches to retain as much water as possible, you could also consider placing some shade netting over the most intensive growing areas, to further reduce moisture loss and cut down on watering needs. Shade netting can also help to prevent bolting in the warm summer months. If you have a container garden, you will find that plants will dry out much quicker than those grown in the ground. To slow the rate of water loss from containers, it is best to move them, if possible, into an area that has more shade. This may be an area beneath a tree, or next to a building. 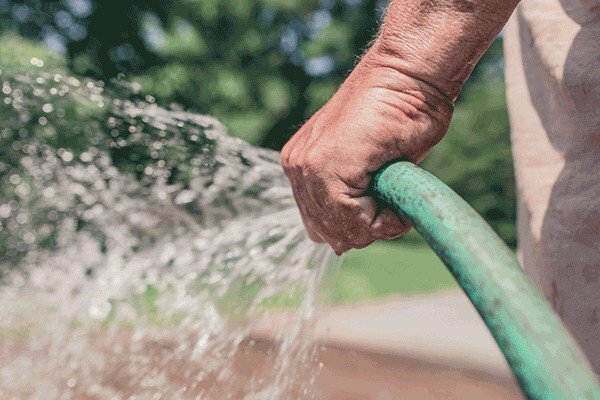 When watering your vegetable garden, beds or borders, it is important to make sure that the water gets to where it is required and does not simply run off the soil surface. Place plant pots or raw clay vessels into the soil and water into these. This will help to make sure that the water is delivered directly to the soil around plant roots, where it is needed. Have you successfully seen your garden through a hosepipe ban? Let us know what measures you took, and how those worked out for you in the comments below.